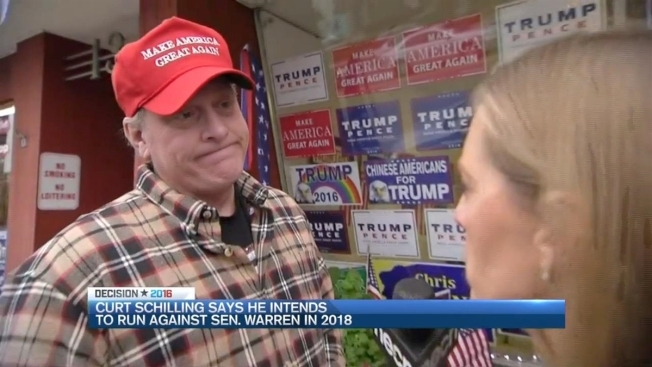 Former Red Sox pitcher Curt Schilling announced plans on Tuesday to run against Elizabeth Warren in the U.S. Senate if his wife agrees, and said that he's ultimately responsible for the collapse of his video game company in Rhode Island, though he didn't apologize to taxpayers left on the hook for tens of millions of dollars. Schilling did his first interview about the failed 38 Studios deal on Tuesday with WPRO-AM. Democratic Gov. Gina Raimondo has said Rhode Island residents were hurt by the bad deal and deserve an apology. Schilling said it's not that he won't apologize, but he wants Raimondo to tell him what he should apologize for. He asked listeners: "What do you want me to apologize for?" The company moved from Massachusetts to Rhode Island in 2010 in exchange for a $75 million loan guarantee, then went bankrupt less than two years later. Does a new campaign issue lurk in Hillary Clinton's State Department emails? Sue's guests are New Boston Post editor Jennifer Braceras and former Massachusetts Democratic Party spokesman Kevin Franck. Schilling said his company failed because it didn't raise enough money, not because he did anything malicious or illegal, and that he has apologized to his former employees. "I couldn't raise the final tranche of money and get the product to launch and that will never be anyone's fault but mine," he said. In a wide-ranging, three-hour interview, Schilling took questions from callers and said he'll run against Warren, a Massachusetts Democrat, in 2018, but must clear the decision with his wife. "I've made my decision, I'm going to run," he said. "But I have to talk to Shonda, my wife, and ultimately it's going to come down to how her and I feel this would affect our marriage and our kids." Schilling took issue with Warren opposing a November ballot question aimed at dramatically expanding the number of charter schools in Massachusetts. He said he's not scared to debate her, noting that the Red Sox defeated the Cleveland Indians when he was a player. "I've beaten the real ones before so I'm not worried about that," the self-described conservative and Donald Trump supporter said, an apparent reference to Warren's claims of Native American heritage. Earlier this year Schilling was fired from his job as an ESPN baseball analyst after comments on Facebook critical of transgender rights. He now has an online radio show. A judge recently approved a settlement with Schilling and three other 38 Studios officials over the 38 Studios deal. The state of Rhode Island sued Schilling and other key players involved. Just one company remains as a defendant, First Southwest, which acted as the state's financial adviser. Schilling said he expects to testify at the trial. "If I was the governor, I would have never even offered this deal," Schilling said. "The government doesn't belong in private business. But I'm on the other side of this. My job and responsibility is to my company and to my employees and I was doing everything I could do, within my legal means, to make that be a success." Raimondo's spokesman said on Tuesday that Rhode Islanders were hurt by the 38 Studios deal and it's unfortunate that Schilling doesn't recognize his part in that. In addition to his radio appearance, Schilling is attending phone bank events for Republican presidential nominee Donald Trump in New Hampshire on Tuesday. He was scheduled to appear at GOP offices in Nashua, Salem and Stratham.